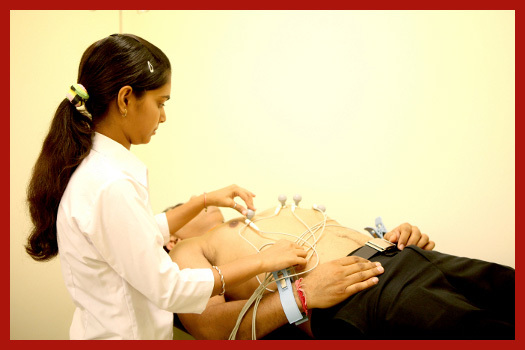 We provide facility for collection of body samples at our clinic. An expert phlebotomist and nurse are available and we have a separate lab/ collection counter for the purpose. Samples are taken here and sent to a highly specialized laboratory for testing. A long list of tests, including most rare and complicated ones, is available. The results are prompt and can be procured at the clinic itself. The latest three ï¿½ channel ECG machine from BPL is available at our clinic which provides for fast and easy ECG testing. Facility for simple, fast and accurate blood glucose testing by single finger prick method using glucometer is available. Being a Pulmonology clinic, we also provide basic lung function testing by peak flow spirometry for all patients suffering from chronic respiratory ailments like asthma, COPD, ILD etc. It is a must for both diagnosis of disease and prognostication of disease on regular follow ups. Regular health examinations and tests help to find problems before they start. They also help to find problems early, when the chances for treatment and cure are better. By getting the right health services, screenings and treatments, you are taking steps that enhance your chances for living a longer, healthier life. Your age, health and family history, lifestyle choices (i.e. what you eat, how active you are, whether you smoke), and other important factors impact what and how often you need health check ups. Schedule an appointment with us to discuss what screenings and examinations you need and when you need them. For screening purposes, radiology and other procedural services are carried out at highly specialized centres, while sample collection for laboratory testing is available at our clinic. You never outgrow the need for vaccines. The specific immunizations you need as an adult are determined by factors such as your age, lifestyle, high-risk conditions, type and locations of travel, and previous immunizations. Vaccinations are recommended for common adult illnesses such as influenza (flu), pneumococcal disease, human papilloma virus (HPV) infection, typhoid, hepatitis A and hepatitis B. Vaccinations against less common diseases such as measles, mumps, rubella (german measles), tetanus, diphtheria, varicella (chickenpox) and meningococcal disease are also recommended in high risk groups. 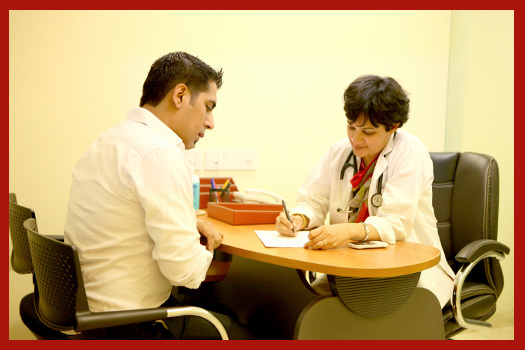 Counseling for vaccination in adults and its administration is done at our clinic. A balanced diet is essential for a healthy body and a healthy mind. You are what you consume! No single food will provide all the essential nutrients that the body needs to be healthy and to function efficiently. A balanced diet should contain proteins, fats, carbohydrates and fiber, all in the right amounts, providing you with a good supply of all the essential nutrients - essential amino acids, essential fatty acids, vitamins and minerals. The nutritional value of a person's diet depends not only on the overall balance of food that is consumed over a period of time, but also on the needs of the individual. To tailor your diet according to your individual needs, customized diet planning and counseling is done by an experienced dietician, who is available by appointment. Also specialized diet plans (eg. weight loss diets, diets for diabetic, hypertensive and dyslipidemic patients, diets for renal failure patients etc.) are formulated as needed. © 2019 MediCasa . All rights reserved.